Dates: 18-28 March (10.5 days, 10 nights) Brand new trip for 2015! 5 of 8 spaces available. Iceland wintertime circumnavation - featuring the classic itinerary of the south coast till Vatnajökull glacier region including icecaves and Jökulsarlon icebergs, then through the remote Eastfjords, and concluding in the Myvatn and Akureyri regions of Northern Iceland. Our 10.5 day photography tour and workshop covering both northern and southern Iceland, the legendary land of fire and ice, focuses on Iceland's beauty in winter, including glacier and ocean landscapes, waterfalls, crystal ice caves, icebergs and glacial lagoons, and above all, giving ourselves unparralled chances and locations to view the Aurora Borealis in all regions of the country. Aurora Borealis viewing depends on 2 main factors: solar activity, and clear weather; a long trip like this gives you the best chances to be in Iceland during these periods of solar outbursts and in various parts of the country should cloudy weather persist over a part of Iceland. Then, we transition to northern Iceland after spending a couple days exploring the spectacular Eastfjords region. The Myvatn is ideal to view the Aurora Borealis due to it's more northerly latitudes perfectly situated under the Auroral Oval region of greatest auroral activitiy. This is also a good time to view the Aurora Borealis, during the height of the spring soltice, which statistically has the most frequent occuring aurora borealis activity. We will especially photograph the famous geothermal areas of Lake Myvatn, and some waterfalls including Godafoss waterfall. We finish our trip in Iceland's second largest town, Akureyri. The Akureyri region is ncluded in the trip price is an internal domestic flight back to Reykjavik at the end of the one-way itinerary. Photography Instruction: A small group size of photographers ensures you will receive ample personal photographic coaching in the field from a full time working pro, and provide an intimate small group adventure experience. This photo workshop is all about in-the-field field photography and situational instruction working alongside your leader, although we can also do image critiquing on client's laptops in the guesthouse in the evenings. Each day the group will photograph diverse landscapes and natural wonders of Iceland, in the quiet and peaceful setting of the Icelandic wintertime. Then, each evening and night the group will enjoy good restaurant meals and a cozy guesthouse, while always being prepared to go out and photograph the Aurora Borealis should it occur. The chances of us photographing this phenomenon are very high, given that we're out for seven nights, and way away from the city of Reykjavik and the southern coast of Iceland. Photographic topics that will covered while shooting include nighttime and austral photography, Aurora Borealis photography, classic landscape photography composition and technique, HDR (High Dynamic Range) imagery, panoramic photography, adventure and travel photography, tilt/shift focusing, and slow shutter -speed effects. Our full 6 days and 6 nights of photography potential, allow us to see a variety of well-known Icelandic natural wonders around Akureyri, Lake Myvatn, and combined with austral wonderment, enable each participant to get the most out this once-in-a-lifetime trip. In good daytime weather and clear night skies, March days can long; sometimes our groups are putting in 20+ hour days! 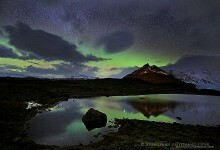 Pro Leader: Johnathan Esper of Wildernesscapes Photography LLC in the USA will be leading the trip, his 10th in Iceland. Johnathan is a full time photographer and international photo trip leader, and has a unique background and an intimate knowledge of Iceland from living out of a car, exploring and photographing Iceland intensively for months at a time, and he specializes in wide panoramic landscapes and adventure photography in Iceland and the Adirondack region in the USA. Johnathan is also very experienced in leading workshops, having led numerous very successful photography workshops around Iceland since 2011 which are often sold-out, and also sometimes works with the very best native Icelandic photographer, Örvar Þorgeirsson. Örvar will hopefully join us as a special guest photographer on one of the days or nights which will be a highlight for everyone, and his images are seen on arcticphoto.is. Trip Details: The cost of this tour is $4200 USD (or Euro equivalent), all inclusive, and begins in Reykjavik on the evening of 18 March 2015 and concludes in Akureyri with your return flight to Reykjavik on 28 March 2015. The trip cost includes domestic airfare from Akureyri to Reykjavik at the end of the trip (to be booked on your behalf once your international flights are booked on our own). Also included is all photographic instruction and guiding, all ground and 4x4 transportation, ice cave local guide, all meals and food (breakfast served in our guesthouse, lunches sourced from local cafes or bagged lunches, and hot dinners at our places of accomodation and/or restaurants), and accommodation for 10 nights (in Icelandic guesthouses or country hotels; accommodation is based on double occupancy, single supplement fee may be added. Most but not all rooms have in-room bathrooms). Accomodation and potential night aurora shooting starts on the evening of 18 March 2015, and the trip concludes with an afternoon flight on the 28th without accomodation for that night in Reykjavik. A $1000 deposit is due at the time of registration, and the remaining balance is due by the trip start. Refunds are allowed at the discretion of the trip leader, with a mix of cash refund and future trip credit, depending on cancellation date. This tour is open to photographers of skill levels, with rural country and landscape and austral photography interests, and a detailed suggested packing list will be provided. We'll be so immersed in the Icelandic countryside for our entire time as a group, that we have left no time to enjoy the sights of Reykjavik, so we encourage you to stay in Reykjavik for a couple days on your own, either before or after the tour. If you have additional questions, the trip leader will be happy to answer them over the phone or email. 2 19 March 2015 Skogafoss and Seljalandsfoss waterfalls, and additional farm scenics. Vik seastacks and Dyroleay headland area for sunset and possible aurora locations. 9 26 March 2015 Myvatn, Krafla, and other geothermal areas.